Mix sugar, corn syrup and 1/2 cup water in 3-quart saucepan. Bring to boil on medium heat, stirring until sugar dissolves. Cover. Boil 2 to 3 minutes. Uncover; continue boiling until syrup reaches hard-crack stage (295°F). Remove from heat; stir in butter, nuts and pepper sauce. Pour mixture onto lightly greased baking sheet; spread out with greased spoon or spatula. Cool completely. Break into pieces. Store in airtight container. 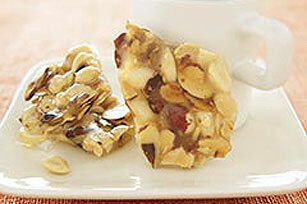 Enjoy a serving of this brittle-a spicy variation of a classic recipe.